How will robots help run Singapore’s hospitals? 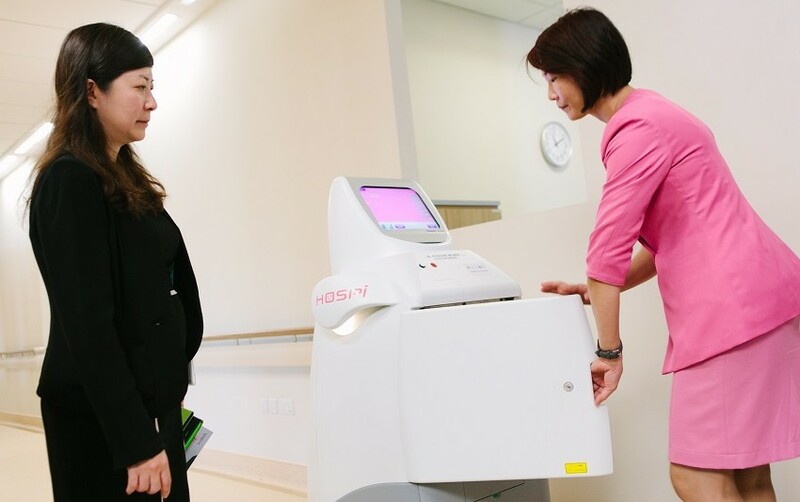 Interview with Selina Seah, director of the national health robotics lab and Assistant CEO of Changi General Hospital. 76-year-old Mr Tan is at the doctor’s for his backache. While he waits for his appointment, a robot trundles up and asks for his symptoms. Later, the doctor prescribes a mobile app with exercises. This could well be the future of healthcare in Singapore. Its national health robotics lab – Centre for Healthcare Assistive and Robotics Technology at Changi General Hospital – is researching and testing new ways to deliver care and improve staff’s productivity. GovInsider spoke with Selina Seah, the centre’s director and Assistant Chief Executive of Changi General Hospital, to find out what lies ahead. Singapore’s ageing population is leading to more complex diseases, people living longer and fewer caregivers – what Seah calls a “triple tsunami”. The government plans to build “smart hospitals” to deal with this onslaught using robotics. Changi General Hospital has started by automating logistics. Transport robots have been working in the hospital since last year, moving documents, drugs, specimens and linen. They navigate obstacles on their own, and are linked with the hospital’s fire alarm system for emergencies. The hospital next plans to use robots to move heavier objects, like patient beds. It is also researching roles for robots to interact directly with people. “We are looking at robots to be the interface between humans,” she says. For instance, robots could get information from patients while they wait to see a doctor. A third area for robots is in precision medicine. The hospital is researching whether robots can be used for surgeries and rehabilitation. “They can help in making sure that the treatment is consistent and precise, far more than a human,” says Seah. Robots would be able to pinpoint the exact location of tumours, for instance, and do less damage doing surgeries. The hospital is researching whether mobile apps can be used for treatments. “We are look at working with certain researchers and also industry players,” she says. Mobile apps can help by gamifying healthcare, she says. Apps can track their performance and use the data to motivate patients to change their behaviour. “People challenge themselves if there is a goal to be challenged on”, Seah says. Singapore is not the only one looking at health apps. The US Food and Drug Administration is looking at “certified mobile health apps”, Seah says, while South Korea and European countries are “fighting to enter”. Such apps are yet to be clinically trialled, however. They must be tested to ensure that patients recover faster. “It’s no different from the rigour one needs to go through for drugs,” she says. Even with new treatments, every person reacts uniquely to exercise, drugs and food. Doctors have to try various combinations to find out what works best for each patient. When the trials don’t work and diseases get more complicated, it becomes “a huge burden to the whole society”. This is “the problem here for us in Singapore”, she says. Singapore is looking at how it can use personalised treatments to prevent complications. “It’s a five-year research programme which has just started,” Seah says, targeting diabetes, stroke and cardiovascular diseases. The country has already taken the first step towards it. It has built a national electronic health records system. It is now looking to build “predictive algorithms” that can analyse data, like blood sugar readings, and recommend personalised treatments. This would be able to alert individuals and hospitals before people fall seriously ill. The vision for smart hospitals could become a reality in three to five years, she says. A few things that will need to change to make way, however. Robots will take over some jobs, people will need to be retrained. “We foresee the need to transform the workforce in the next five to ten years,” Seah says. Security will have to be improved with the increased use of data analytics. Some mobile health technologies are still “hackable”, she says. Singapore will need to “be a step ahead on cyber security issues”. A third challenge is coordination across government. “There are many personal views about robotics”, she says, and “even more” about health robots. Getting all the stakeholders to agree on funding priorities has been “a rather long engagement”. The health robotics lab plays a crucial role in bringing all the stakeholders on the same page. A visit to the doctor in the future could mean a prescription of mobile games and treatment by robots.